Looking for more information on healthy eating? 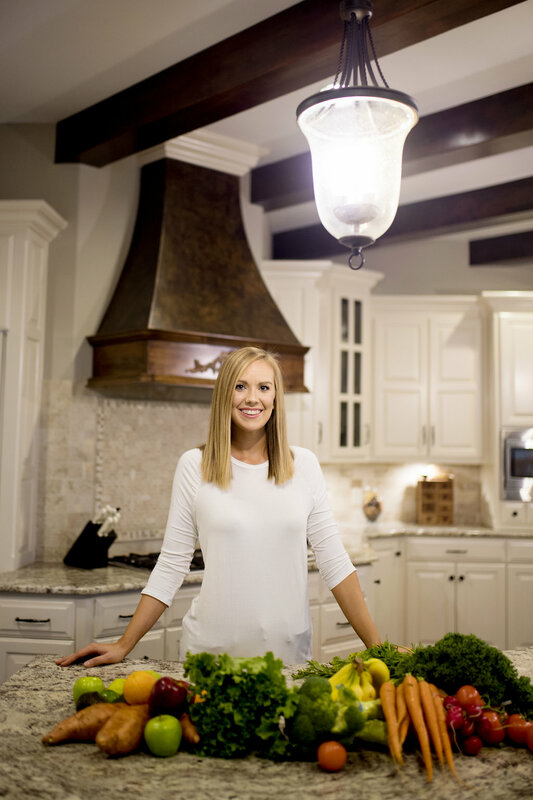 Whether you’re just looking to kick-start your health habits or you’re a seasoned pro – my private Facebook group offers a more intimate look into various topics, such as nutrition education, meal planning 101, meal prep tips and inspiration, recipes, and budget-friendly meals. We also cover important topics regarding behavior, body image, physical activity, mental health, and more! This is a closed group for women only. Find my group and join us! My blog offers some of my favorite recipes, but my Instagram page offers SO much more! A quick browse through my photos and you will see I not only love to take pictures of the beautiful recipes I make, I love to share WHY these recipes are nutritionally sound. 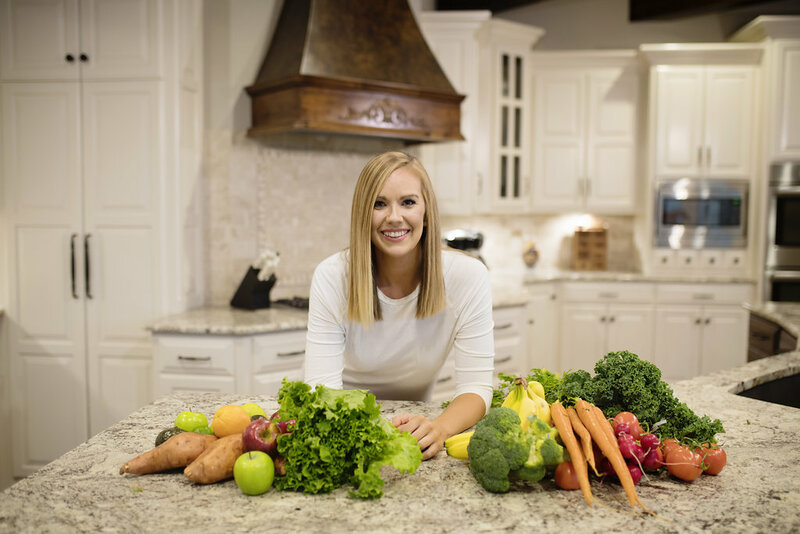 From vitamins and minerals to the importance of fiber to topics like phytonutrients – I love to show others that you do not have to sacrifice your favorite foods to eat a healthy, balanced diet. Connect with me on Instagram today! My public Facebook page is a space for me to share my message about how to live a balanced, healthy life without feeling overwhelmed in our busy lives. 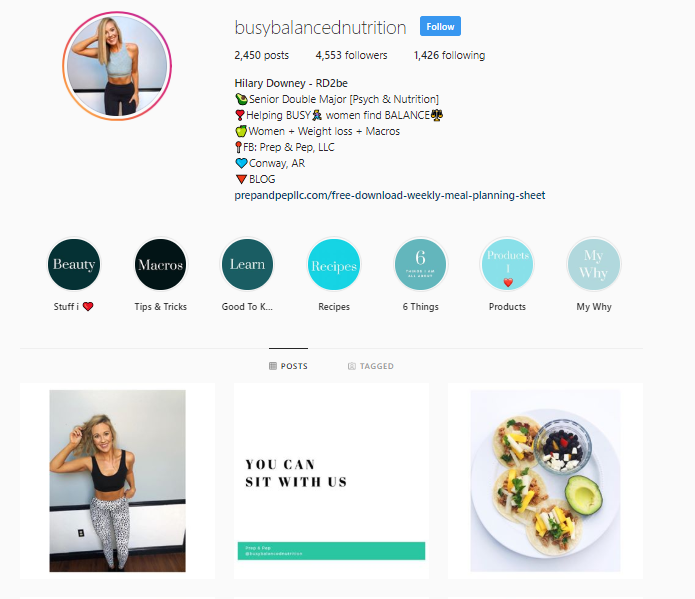 I use this platform to share recipes, pep talks, educate and inform, and do Live videos where I cook and talk about many relevant health topics such as meal planning and prepping, nutrition choices, time management, mindset, and more! I also do giveaways and share special announcements for things like my challenges! Like and Follow my Facebook page! My name is Hilary Downey. I am a 28 year-old mom to two toddler boys. I am a double major currently obtaining my Bachelors of Science in Nutrition/Dietetics and my Bachelors of Science in Psychology at the University of Central Arkansas. I know that nutrition and eating behaviors go hand-in-hand; my education in both nutrition and psychology gives me a deeper understanding of eating behaviors and greater tools to better help others not only reach their goals, but maintain them long-term. My most valid experience yet? I’ve been there. I was overweight, suffered from low-energy, had an unhealthy relationship with food, and did not know where to begin. I truly believe every woman can learn to balance life, work, relationships, and families while still making herself a priority. All you need are the right tools and the right person behind you to change your life forever. YAY! You survived the week! I hope your week wasn’t too stressful, but odds are you dealt with some stress at some point this week and if you’re like me, you’re glad it’s over! Whether it be kids, jobs, school, relationships, bills, the news, etc., we are faced with all kinds of stressors. But, it’s Friday and it is time to relax! Maybe you plan to blow off a little steam and have dinner and a drink with your girlfriends or maybe you plan on parking it on your couch and having a Netflix binge all weekend or maybe you just want to spend some time relaxing with your family. One thing is for sure, you deserve to relax however you please. But what happens when your form of relaxing is throwing your hands up on your eating behaviors and saying “I surrender!” All. Weekend. Long. Now, I’m not talking about taking your foot off the gas pedal just a little. Sometimes that is inevitable with having family home, needing to grocery shop or prep, going out to eat, etc. What I’m referring to is leaving work on Friday and having dinner with your girlfriends and having one too many chips and salsa plus your entrée plus a margarita (or two). Feeling bad about it the next day and continuing the destruction while you binge on Netflix and eat cookies straight out of the package. Maybe you haven’t grocery shopped so you grab fast food for dinner that night. And Sunday…well. What’s the point in stopping now? May as well have one last hoorah! Sound familiar? It does to me. 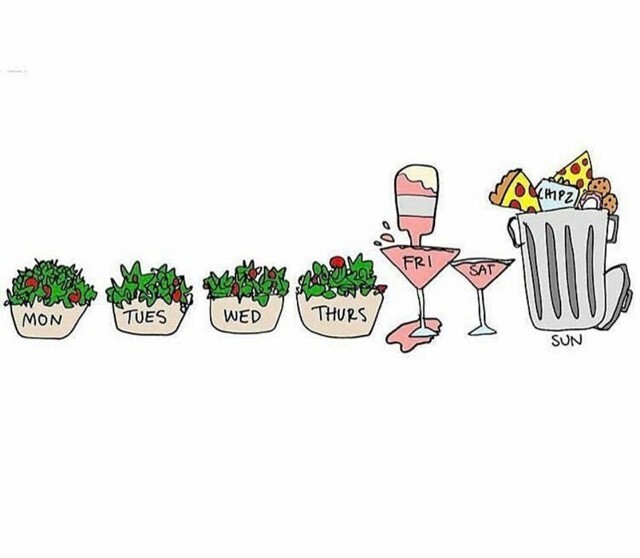 I repeated this cycle for a long time before I overcame my weekend overeating! When I was engaging in this eating behavior my progress was slow, I felt out of control, and a lot of times it ended in insane bloat and stomach discomfort. It took some trial and error and LOTS of practice, but once I figured out the skills that helped me stop the cycle, I was able to break those destructive habits for good! 1) Have a plan. It’s all about preparation, right? Don’t wait until you’re faced with the obstacle to figure out how to tackle it. Set a game plan for yourself. You know the weekend is coming. If you know you’re going out to eat, figure out what you’re going to order ahead a time and set a drink limit for yourself. 2) Allow yourself some leniency without throwing in the towel all together. This is considered “black and white thinking”. Try to avoid this way of thinking. Allow yourself some chips and salsa without eating the whole basket. Have some cookies while you watch your shows without overdoing it. This comes back to number 1. Plan and prepare. Set an amount ahead of time, take that amount only, and put the rest away. 3) Avoid the food completely if you aren’t ready for number 2 (I’ve been there). If chips and salsa or the bread basket are your weakness, see if you can go to a restaurant where you aren’t served an appetizer. If you have to be around the food that may be triggering, avoid it altogether. 4) Grocery shop during the weekend, particularly on Friday or Saturday. This is something I implemented and I love it! I used to become frustrated during the weekend because I wanted to eat well but I didn’t grocery shop until Sunday or Monday and all of my fresh food would be bad by the weekend, leaving me with an empty fridge and not-so-good choices. Now, I grocery shop on Friday evening or Saturday morning and I’ve got fresh, healthy food for the whole weekend! I even plan a fun, new recipe to try out on Saturday. 5) Change your environment. If watching Netflix on your couch while snacking has been your normal routine, maybe try changing where you sit or what room you watch in. 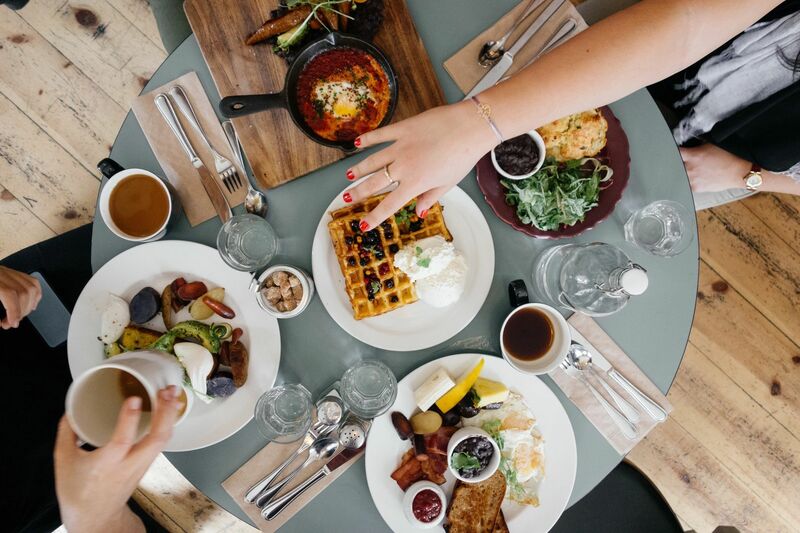 This may seem silly, but eating habits are behavioral and research shows that our environment largely affects what and how much we eat (see first link below). Try switching up your environment and see if that helps. 6) Find activities to look forward to that don’t involve food. Spend your Saturday going on a hike, or check out the new store in town you’ve been wanting to visit. Take a mini road trip to a neighboring town and check out antique stores or go to the library and find a new book. Maybe plan a family activity like going to the park. If your usual methods of relaxing involve food, you may try finding new methods helps you relax in a different way. No doubt about it, life is stressful and food is GOOD! 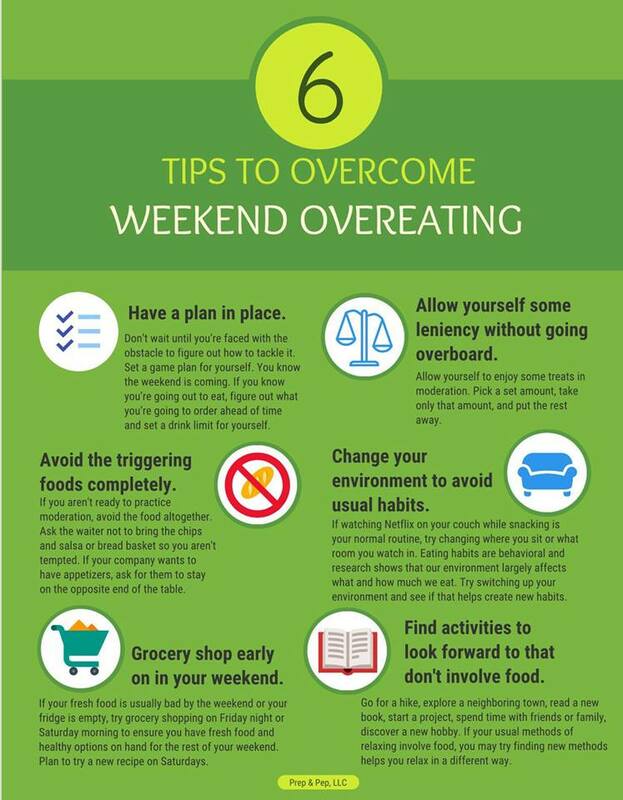 But weekend overeating may be sabotaging your progress or making you feel out of control and downright ill. Try out the tips above and check out the article below to help you conquer overeating.